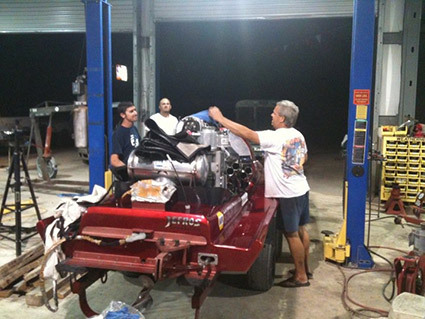 Family-owned and established in 2010, Rio Medina Truck & Auto Repair and Marine has been providing superior automotive service to the community of Rio Medina, TX and the surrounding areas for years! We are a full-service automotive repair shop, as well as an automotive paint and body specialist with a marine division servicing motor boats, jet skis and more! When it comes to your vehicle’s maintenance and repair, it’s important to trust an auto mechanic in Medina County, TX that’s going to treat your vehicle as if it were their own. Delivering quality auto service starts with being invested in the customers and vehicles you’re serving, which is why Rio Medina Truck & Auto Repair and Marine always puts the best, highest quality workmanship forward. We aim to earn the trust of our customers, so they never have to wonder if they’re in good hands: they know they are each and every time they roll onto our lot. And, with more than 25 years in business, we’ve worked hard to earn the stellar reputation we’re known for! Our mechanics are all ASE Certified, highly skilled and have years of experience. Most of all: they love cars and care about yours! We’re committed to providing you with the highest level of service, no matter the work. Our first-time customers continually become our long-term customers time and time again, choosing us for all their auto needs. We have an A Rating with Better Business Bureau of Central, Coastal, Southwest Texas and the Permian Basin! We’re a member of the Castroville, TX Chamber of Commerce. If your vehicle is in need of service, we want to help! Contact us today to schedule an appointment and we’ll get your vehicle running like new again in no time at all. "Great People and they do great work You can not go wrong with Mickey and His people." September 11, 2018 Terri S.
"Wonderful people. Great work. " April 3, 2017 Gypsy R.
"Fixes me up every time. Ask for joe, but all the ladies and gentlemen, there know what they're doing . I will continue to bring my vehicles ..."
October 29, 2016 Jen S.
"Did a great job repairing my son's car at a fraction of the time and cost quoted by everyone else!" "I had my car painted here recently due to hail damage. I was very pleased with the results. It was in a timely fashion, reasonably priced, e..."